Custom Copper Border Tiles: Build To Any Size. Add Custom Designs. Everything We Build Is Built To The Customer's Specifications. 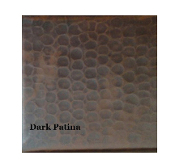 You Choose The Size, The Design (Custom Designs Welcomed), Plus Mix & Match 16 Patina Finishes. Have Questions About Ordering Copper Border Tiles? Call Customer Service At 800-989-5166. Before Buying, Be Sure To Check Our Coupon Page For Our Latest Sale Discounts!